Modern-day concrete intersecting with 18th century brickwork. 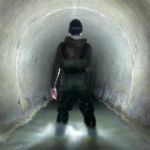 Perhaps the most interesting underground features in the Montreal area are found within the old sewers built during the mid to late 1800s. Usually constructed entirely of brick and of sizes up to 9’ in diameter, they often appear to be steeped in history in a way that newer concrete sewers just can’t compare to. They have a warmer and organic quality to them as well that I tend to appreciate. Where concrete sewer systems can feel like cold modernist pieces of architecture, the brick ones seem more like inviting Victorian homes. A good example of these characteristics can be found within the Point St. Charles Collector. As its name implies, this sewer was responsible for the drainage of the eastern half of Point St. Charles. (The western half was serviced by another sewer that I first started to explore in this entry). 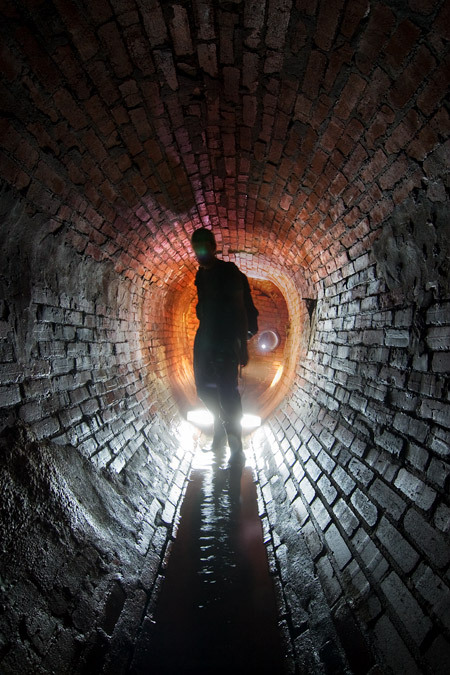 The sewer was also responsible for a portion of the neighbourhood once known as Victoriatown. 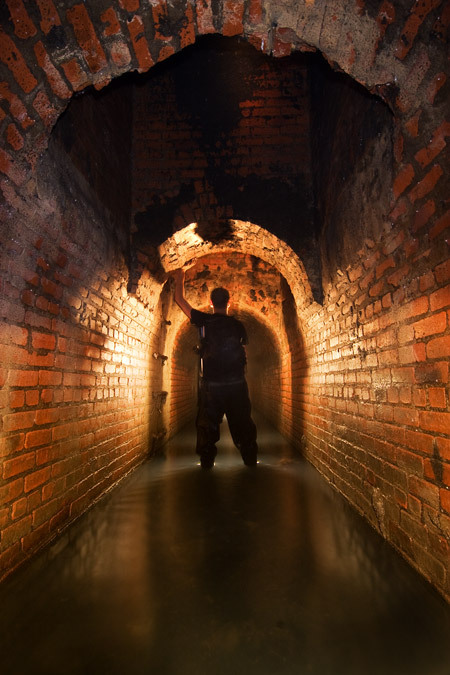 Given that so little from this area can still be found at street level, it’s of some comfort that at least its sewer system can still be found and explored today. 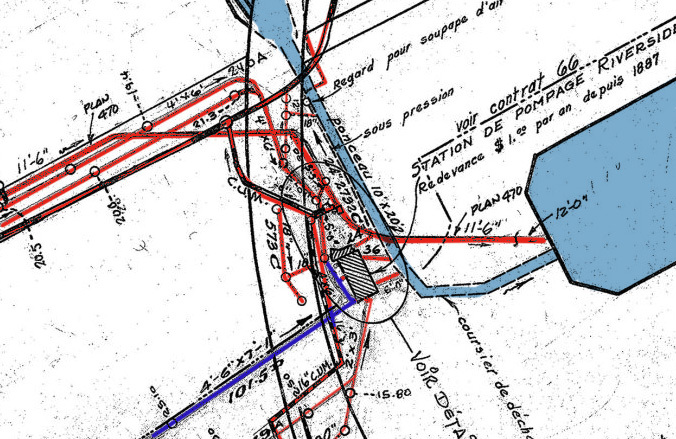 Late 1880s representation of Montreal superimposed with the paths of the Point St. Charles Collector. The oldest section of this particular system was constructed between 1862 and 1864, a time when the city was starting to implement its first master drainage plan. While some stretches of the creeks running along Craig Street (now St. Antoine) and William had already been covered over, the Point St Charles collector represented the beginning of a new era of widespread and methodical wastewater management. Five additional collector sewers would be built during this same time, only a few years after London and Paris finished developing their now legendary underground systems. 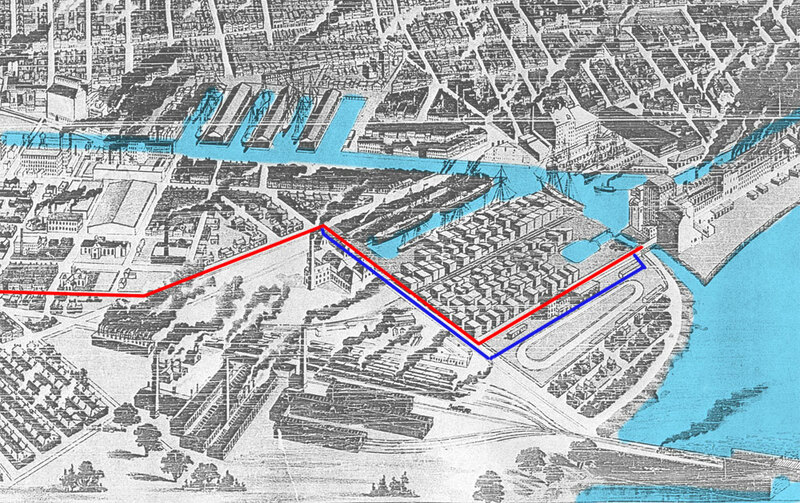 In its initial stages, the outlet of the Point Saint Charles collector was situated at the edge of a drainage channel for the Lachine Canal. This channel has mostly been covered over, but a portion of it can still be seen today underneath the Bonaventure highway opposite Farine Five Roses. In this same area, the Riverside Pumping Station was added in 1887 to help alleviate the system during spring floods. Shortly thereafter, a secondary sewer line was also added. A larger and deeper concrete tunnel would come decades later, and then another one still came during the 1990s with the introduction of the island’s interceptor network. Today, the area is a confusing mash-up of old meets new technology which is hard to make sense of even when you’re inside. The underground spaghetti junction found at the intersection of Bridge and Riverside. Standing inside the lovely 147 year old egg-shaped section. Using this area as a starting point, one can make their way a short distance into the oldest 4×6′ section of the sewer. I say a short distance, because, for whatever reason, the section approaching Bridge St. is filled to the top with rubble. 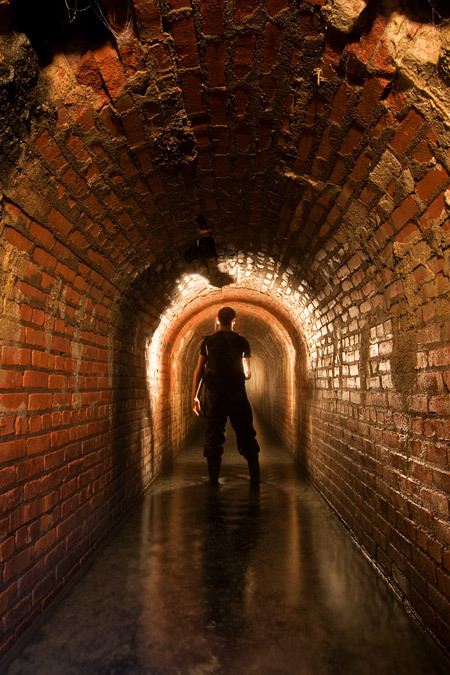 As far as you can get through the oldest section of the sewer. I imagine there must have been a fair amount of trial and error when it implementing drainage systems in the 1800s. In this case it’s unclear if the tunnel simply collapsed or of it was deliberately taken out of commission and filled with whatever was convenient at the time. The last 50 meters or so of this section are half full of debris which makes it a bit uncomfortable to get through. It’s strictly crawling-height at this point, with the only payoff coming from being able to play guerrilla archaeologist while sifting through the rubble. 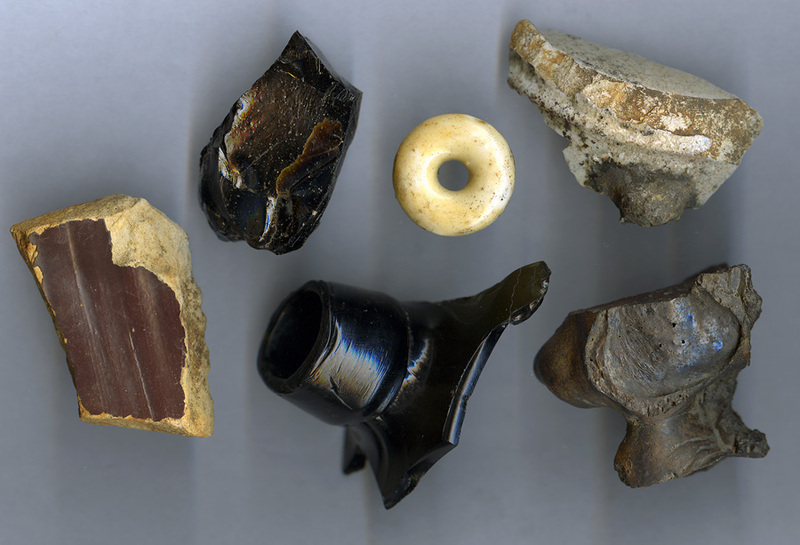 Here you’ll find fragments of old glass, pottery and other unidentifiable materials. I’ve yet to find anything valuable inside a sewer in Montreal, but the bits and pieces of objects encountered in some areas are often interesting enough to make a bit of digging worthwhile. Just mind the worms. And the mosquitoes, too. Various artifacts recovered from within the sewer rubble. A few minutes of picking through the debris revealed the crown of a dark hand-blown bottle that closely resembles the one shown here for Hostetter’s Stomach Bitters. Regardless of what company the bottle came from, it likely dates from at least the 1870s. Inside the placid stretch of the collector that was later built during the 1880s. Perhaps as a result of problems encountered with this older sewer, a second relief line was later built that runs parallel to the original one for most of its course. Its exact construction date is unknown, but it’s safe to say it was probably built during the late 1880s around the same time the Riverside Pumping Station was completed. A bit of a tight squeeze through a 2×3 foot side-pipe will allow you to enter this section. It has a wonderful arched shape which is common in other cities, but is something that I haven’t encountered before in Montreal. From here it’s easy to get through thanks to a hard layer of sediment lining the bottom that you can easily walk on top of. This 1km long stretch is almost 7’ in height, but the grit and gravel removes at least a foot from this. A shaft underneath Bridge Street once used for dumping snow into the sewers. 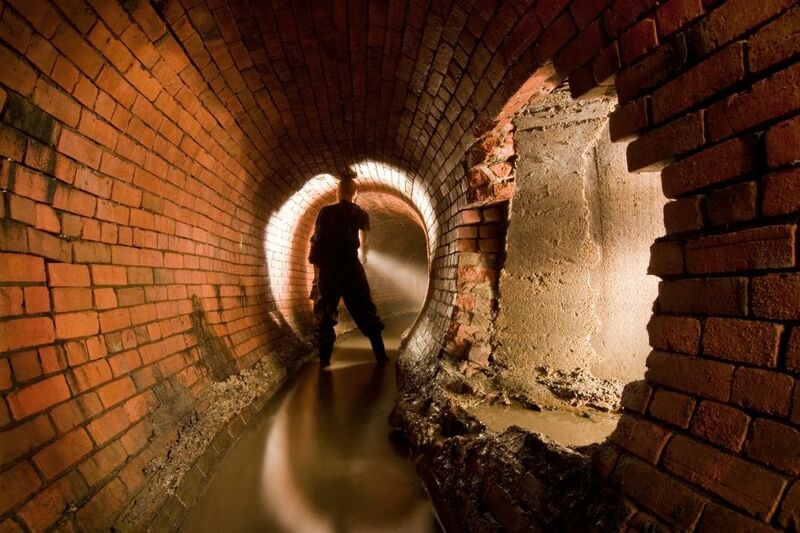 Unlike other sewers built around this time, there were no streams passing through this territory whose waters could be redirected to help keep the system free from silt and other debris. I don’t imagine the smaller sewer connections entering from the nearby stockyards and the Grand Trunk Railway shops could have helped much either. Things are fine up until you reach the intersection of Bridge and Wellington where the sewer makes an abrupt turn to the west. Here the solid base of debris becomes a sloppy mess that’s less forgiving when it comes to supporting your weight and it’s at this point where things start to get fairly uninviting. The 130 year old brickwork changes to a shorter and much newer pre-fabricated concrete pipe that’s half-full of water. At this point there isn’t much incentive to push forward so your best bet is to turn around, go down Bridge Street and head back out. What are most likely the roots of a poplar tree that have found their way into the moisture of the sewers. One interesting feature of this stretch is the vegetation that’s managed to finagle its way in through to the sewer in search of water. 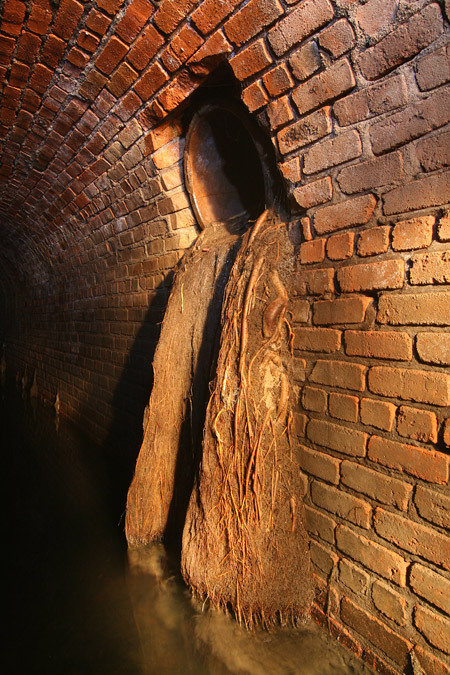 The roots of some trees have taken the easy route in through smaller connecting pipes, but in other cases, some roots have actually pushed their way right through the mortar of the brickwork itself—no small feat considering most of these older sewers were lined using 2-3 rows of bricks. 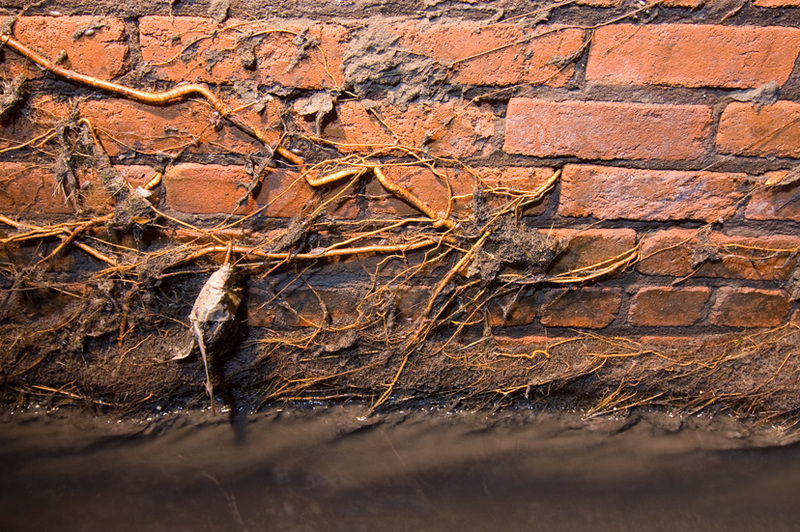 Smaller roots that were determined to find their way to water through the brickwork. 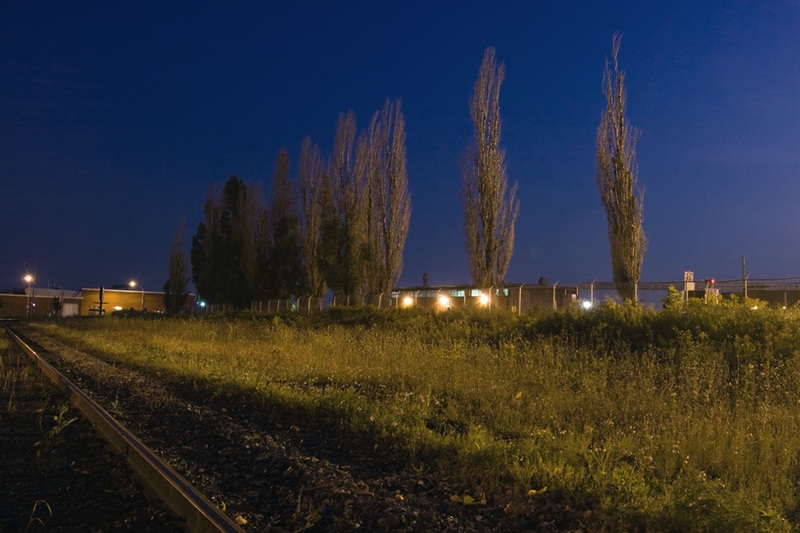 The line of poplar trees and sumac situated in an area that the sewer passes through are the likely infiltrators. Half these trees look healthy, while the other half look as though they’re about to die so it’s hard to say just what effect the sewage is having on them. I’ll let the botanists and environmentalists out there figure this one out. The line of trees South of Mill Street that are presumably drawing water from the sewers. 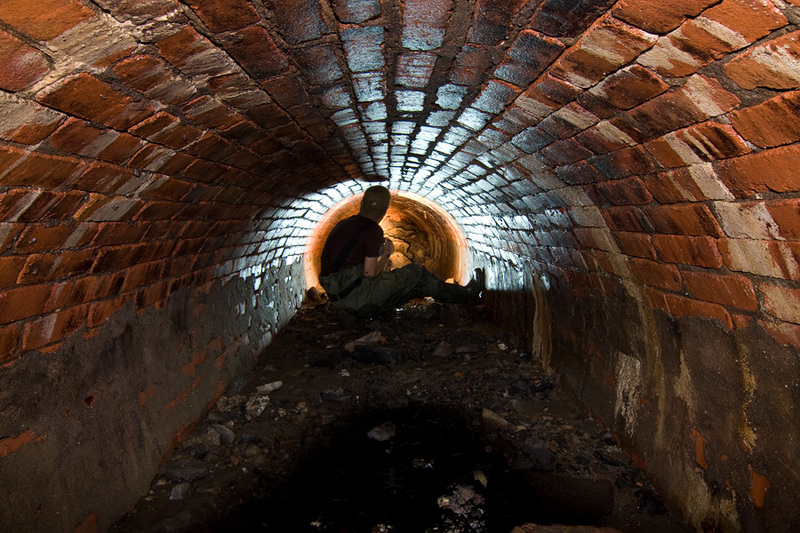 Hey there, will you ever be going back to explore these sewers again?If so let me know i’d love to join you when you head out, they seem really interesting. hi! my mother side of the family come from pointe st-chatles and I was looking for archives. I can imagine it must have been very passionate for you to discover all this. when did you think of doing such a thing and why? The underground spaghetti junction is at *Mill* and Riverside, isn’t it? Interesting adventures and history, very nice photography. All I can say is WOW and more pictures please. Awesome descriptions! noticing that there are many dead ends underground, world wide. all filed with dirt like material, seems to me like they are the way to the sewers for underground city’s populated by societies of sorts, take your pick. I would really like to dig out that dirt and continue deeper to see why the tunnel has been kept closed. If it was intended to make these locations closed for sewage and city maintenence, it would have been bricked. almost like the dirt is comming from the other side. Maybe one day I will have to take a look. something seems wierd.. anyones thoughts? ?